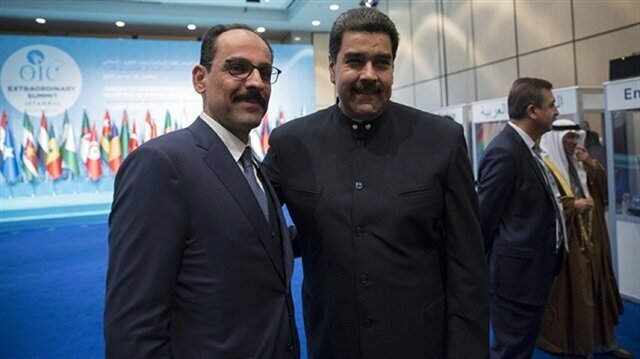 Venezuelan President Nicolas Maduro was among the attendees of the Organization of Islamic Cooperation’s (OIC) extraordinary summit held in Istanbul on Wednesday upon Turkish President Recep Tayyip Erdoğan’s call following U.S. President Donald Trump’s decision on Jerusalem. President Trump last week formally recognized Jerusalem as Israel’s capital and initiated a plan to move the U.S.’s Israel embassy from Tel Aviv to the holy city. “Today we finally acknowledge the obvious: that Jerusalem is Israel’s capital,” he said at the White House. Turkey invited leaders of over 50 Muslim nations to Wednesday's meeting in Istanbul to formulate a joint response to Trump's decision. President Erdoğan had received his Venezuelan counterpart on Oct. 6 in Ankara, and five agreements were signed between the two countries. "We want to open a new era in relations between Venezuela and Turkey," Maduro said in a joint statement with Erdoğan. “We want to sketch out a new era for the world. A multi-polar world where everyone can find their place,” he added.